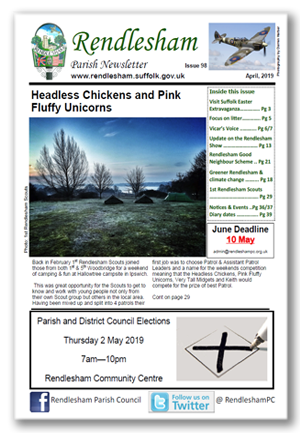 The Rendlesham Parish Newsletter is produced by Rendlesham Parish Council and circulated, free of charge, to all households and businesses in Rendlesham - around 1,500 distribution. The first issue came out in March 2011 and for the first year was mainly funded by a grant from County Councillor Michael Bond. Included in The Rendlesham Parish Newsletter are the Church 'Keep in Touch' pages, local information on events, adverts from local businesses, reports from the Parish Council and other local groups as well as local interest stories. If you would like to advertise your business or event, or place an advert in the Rendlesham Parish Newsletter contact the Parish Council. Please click here to see our Advertisement Rates. Where do we send the advert? The advertiser's name, business name, business postal address, business email address, the advert itself, the size of advert required and the advertiser;s contact telephone number please. How much notification do you require to place the advert? The advert must be with us no later the the 10th of the calendar month preceding the month of publication/issue. So for the December issue, we need it for the 10th November please. In which format must the advert be sent? JPEG is preferred but PDF, Word or Publisher is perfectly acceptable too. Can we change the advert at any time? Yes the advertiser can change an advert at no extra charge to add special offers etc - even month by month chnages are acceptable at no extra charge. The advertiser simply sends us the revised advert (at the same size as the size of advert originally booked), and we insert the new advert and remove the old advert. If any changes are required to the advert, how much notice due you require? By 10th of the month preceding the month of publication. The advertiser provides a new advert incorporating the changes, and we simply insert it. Rendlesham Parish Council will invoice the advertiser by email and the payment instructions are on the face of the invoice. Please make payment within seven days of receipt. When is the Newsletter distributed? Within the first few days of each month. To whom is it distributed? A team of volunteers deliver one copy of the newsletter to each of the 1400 households and businesses in Rendlesham. Extra copies are left in the Church and Tunstall Garage for visitors to pick up.